View on the platform at Chelford after the accident of 1894. Taken from the LNWR Minutes, the Chelford accident of 22/12/94 resulted in LNWR third class 666 and supplementary milk van 2186 being broken in pieces. In addition the following were damaged:- 1406, 650, 1397,864 and 1408 lavatory composites, 235 first class, 189 and 1283 composites, 1103, 213, 247, 1110 and 328 thirds, and 169 brake van. Four of these carriages were part of London Road �distant coupled� train No.6 which was standing in the up siding. The cost of the damage to these 14 vehicles was �853. As 14 passengers were killed is was clearly a very expensive accident for the LNWR. In addition GWR 1559 third class was damaged beyond repair, and GWR 1339 brake composite, 522 third class and 816 brake van were damaged to the extent of �350. The vehicle on the left is GWR four-wheeled third 522 (number visible) and curiously it seems relatively undamaged. It has flat sides, and according to the accident report was built in 1867, and it may well be something originating on one of the lines absorbed into the GWR, or even converted from the broad gauge. It is lit by oil lamps and it is surprising to find such an antique (25 years old) included in a main-line express train. It was the second vehicle in the train, and was marshalled immediately in front of a 48ft 0in bogie composite carriage which was the heaviest vehicle in the train. 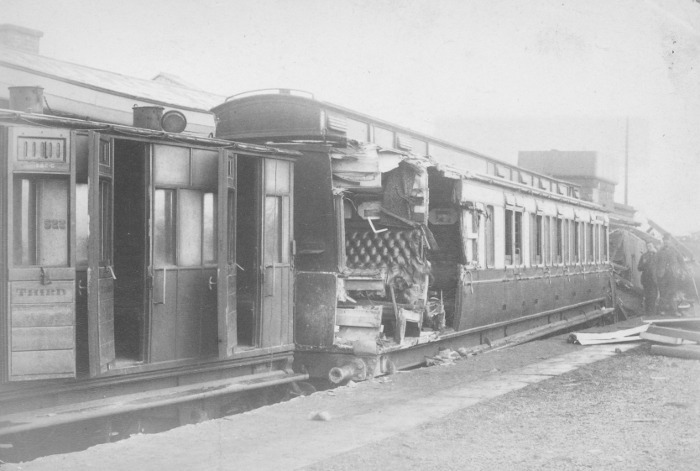 The vehicle on the right is GWR brake composite 1339, which was doubtless repaired. The worst damage was in fact suffered by carriages near the centre of the train, which became tangled with the debris of the goods wagons. The order was given to renew LNWR third 666, which was a 30ft 1in third built in 1888. Its replacement was of the same type, turned out on HYE 5/95 and it lasted in service until 12/34. I now realise that London Road “distant coupled” train No. 6 is a bowdlerisation of “District coupled” train No.6. Yesterday I obtained a copy of the Chelford accident report from the LNWRS Library at Kenilworth (did I tell you what a great facility this is, so easy to use), and I have just read it. The report is 14 pages, one of the longest I have seen, and very thought-provoking if rather sobering. Students of railway history must accept that sometimes it involves personal tragedy. A salient lesson is that even the smallest details of railway operation can lead to tragedy. The cause of the accident was a wagon, which had been separated from its train during shunting, being blown along the Down Main in a gale, and being hit by a raft of wagons being shunted into the down siding. This resulted in it being lifted, twisted round and pushed across the Up Main when the 4.15 Up express was only yards away, running at around 60mph. The express smashed into the wagon and pushed its remains along the line for some distance before it hit the standing rear portion of the goods train on the Down Main. In doing so it took out a substantial portion of the signal cabin. The express then derailed and the sudden stop resulted in its carriages piling up on top of the goods wagons. The leading engine mounted the Up platform and then toppled over. Just imagining the scene makes the heart sink - especially as a railwayman myself. 14 passengers (names listed) were killed and 79 injured. No Rules were broken, and the then-existing Rule 257 was found to be deficient. The accident may have led to some changes of the Rules regarding shunting, especially during high winds, although this is a matter for further investigation. Maj Marindin did recommend some extra provisions. The 4.15 from Manchester London Road was formed of 16 vehicles equal to 17 1/2 and hauled by two engines. The 10am Down pick-up goods from Crewe was the return of the 5.10 from Longsight. It was due back at Longsight at 2.22pm, but was running at least 3 hours late, and had "lately been running very late", said to be on account of bad weather during December. Some details of the Drivers', Guards' and Brakesmen's duties can be deduced. The vehicles are listed in train formation. The first four vehicles of the train were GW ones, and presumably formed a portion to go forward from Crewe to Shrewsbury and beyond. The marshalling of the remaining 12 might indicate two or more portions, perhaps for Birmingham and London. We have no Marshalling Circular anything like as early as this so we can only speculate. The photograph is taken from the north end of the Up platform, with the damaged signal cabin just out of view to the right. To confirm Philip's comments, the vehicles shown are GWR 4w 522 and bogie 1339 (2nd and 3rd vehicles respectively). In the list on the first page of the report, 1339 is described as "bogie composite" but it is clear that it was a composite brake, and it listed as such in Appendix III. It was built in 1890. The damage was described by George Whale in his evidence as "front part of body stove in with a number of bricks in the front coupe" and in appendix III as "One first class compartment, end and sides damaged; four step-boards, four buffers and one axle-box damaged". 522 was described by Whale as "very slightly damaged", but in fact it had "Two headstocks and both ends damaged, four door-glasses and five quarter-lights broken, four buffers bent". The rest of my comments refer not to the photograph, but to Philip's notes on the coaches. There are a few discrepancies between Philip's details and those in the report. 1283 is listed twice therein as a composite brake, but in Appendix III as a third brake! The coupled train is shown to include third 231, not 213. I can find no mention of third 247, but the 15th vehicle was 6 wheel third 1087. It is interesting to note that the LNWR vehicles were a mixture of 6 wheel stock and 42ft bogie stock, marshalled mixed together. The latter were four of the lavatory composites (mostly new ones of 1893, therefore D159 or D167) and the composite brake (of 1889? maybe D229). Bogie lavatory composite 864 is listed as built in 1884, but surely this must be an error - the LNWR didn't have any bogie vehicles before 1886, did they? "Distant-coupled Train No.6" are the words used in Appendix III. Presumably this consisted of 4 wheel or 6 wheel stock, some years before replacement with bogie stock. Only four carriages in the centre of the train are mentioned, F235, T1110, T231 and T1108, so the train length is unknown. There is no need to go to Kenilworth to study the Chelford accident report. It is available online. 1406 42ft 0in lavatory tri-composite. Page 52 of 1895 Diagram Book. (D.159). Built HYE 11/93. 666 30ft 1in five-compartment third. Page 106 of 1895 Diagram Book (D.297). Built HYE 11/87. 189 30ft 1in luggage tri-composite. Page 79 of 1895 Diagram Book (D.197). Built HYE 5/92. 650 32ft 0in lavatory tri-composite. Page 63 of 1985 Diagram Book (D.195). Built HYE 11/89. 2186 26ft 0in supplementary milk van (six wheels). Converted c.1890 from 26ft 0n brake van built 1871. 1283 42ft 0in brake composite (2nd/3rd). Radial. Page 87 of 1895 Diagram Book (D.354). Built HYE 5/89. 1397 42ft 0in lavatory tri-composite. Page 52 of 1895 Diagram Book (D.159). Built HYE 11/93. 328 30ft 1in five-compartment third. Page 106 of 1895 Diagram Book (D.297). Built HYE 11/87. 864 42ft 0in lavatory tri-composite. Radial. Page 49 of 1895 Diagram Book (supplemented so not in 1915 book). Built HYE 11/84. 1408 42ft 0in lavatory tri-composite. Page 52 of 1895 Diagram Book (D.159). Built HYE 11/93. 1087 30ft 1in five-compartment third. Page 106 of 1895 Diagram Book (D.297). Built HYE 11/87. 169 30ft 1in brake van. Page 125 of 1895 Diagram Book (D.385). Built 1890. The carriages of London Road District Set No.6 were elderly 30ft 6in stock dating from the mid-1870s. It would be too tedious to identify them more particularly. I regret that 213 was my typo for 231. Another typo - Third 247 should read 257 according to the Loco Committee Minutes, but I agree that this seems to be a mistake as it does not appear in the accident report. Perhaps Major Marindin considered its damage was too trivial to bother with. C.864 was of course radial, not bogie. But I don't see where in the report it is described as being bogie, simply eight-wheeled. It was effectively undamaged, just one pair of wheels derailed. C.1283 was a second/third composite brake. Apart from the upholstery (and the number in the composite series) this was identical to the brake-third version. These detailed replies show what an interesting and useful feature this board is! The full report can be seen on your computer screen, on Wikipedia under "Chelford rail accident". Among the references on that page the BoT Accident Report can be accessed, including a clear and detailed plan. In the Report's list of deceased victims two of them are named Pilcher, which makes me wonder if they were related to the two Percy Pilchers, both born in 1866 - the famous aviation pioneer killed in 1899, or the early railway photographer of the LNWR, Great Northern and Great Western (etc), the subject of this Society's 2007 book. Pilcher is a far from common but not an especially rare surname. The internet tells me that at present there are about 3,000 people in the UK with the surname Pilcher (compared with about 9,000 Millards). Say perhaps 1500 in the 1890s. But we can guess that the two Mr Pilchers killed in the accident were related � perhaps father and son. And it is possible (but not very likely) that they were distantly related to the Pilchers Harry mentions.